Battlestar Galactica: How Long Will the Journey Last? After months of anticipation, fans of Battlestar Galactica were relieved to hear that the Sci Fi Channel had renewed the adventures of Commander Adama and crew for a fourth season. Unfortunately, Sci Fi only committed to a 13 episode order. Typically a short order indicates a channel’s lack of commitment to a series and its future. Well, this time it might not be such a bad thing. As science fiction fans know, the present version of Battlestar Galactica is actually the third generation of Battlestar television series. The first debuted in September 1978 and was cancelled after one successful season. (A theatrical version of the pilot was released in May 1979.) A less successful spin-off series entitled Galactica 1980 debuted less that a year later and only survived for 10 episodes. Legions of fans kept the series alive through books and other fan fiction. The current Battlestar Galactica series is actually a re-imagined version of the original series, from the mind of Star Trek veteran Ronald D. Moore. It began on December 8, 2003 as a three-hour mini-series on the Sci Fi Channel. The mini-series was so popular that a full-blown series followed and began on January 14, 2004. The series follows the surviving humans of the Twelve Colonies of Man as they search for the mythical thirteenth colony — a little place called Earth. Their own home has been destroyed by the Cylons, a race of humanoid machines. The Cylons pursue and attempt to destroy the survivors because they believe the human race, their own creators, to be a flawed creation of God. 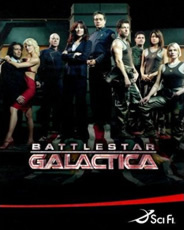 Battlestar Galactica explores a myriad of subjects — theology, society, politics and humanity — in complex adventure and character driven storylines. The show has been called the best series on television by several critics and is sited as being the most complex science fiction series ever. The first season of Battlestar averaged more than 3.1 million viewers which is quite good for a cable series. The second season lost some viewers but still remained respectable with an average of 2.3 million. Viewership initially dropped even further for the third season. The third season debuted in October 2006 and was down almost 30%, compared to the second season’s return (in July 2005). The first four episodes of the third season were down an average of 20% overall. The decline was likely due to its debuting during the regular networks’ fall season. Sci Fi moved the series to Sunday nights in January and the ratings have improved significantly. Would this improvement be enough to warrant another season? Though the renewal was for only 13 episodes, Battlestar producer David Weddl has confirmed that 13 was the minimum order. Sci Fi is trying to decide whether to order a full season of the series. If a rumor is true, this could be a rare case when a full season may not be a good thing. According to Syfy Portal, a source close to Sci Fi says that additional episodes in the fourth season would likely mean the end of the series. If Sci Fi decides against a fifth season, they would likely give the producers nine additional season four episodes to bring the series to a close. This likely has a lot to do with the series’ costs — it’s quite expensive for a cable show. On top of marketing costs, the Battlestar cast is large and each episode has a lot of special effects and big sets. Sci Fi’s pride in the series is evident so the series’ fate isn’t being treated lightly. What will happen? We probably won’t know for quite some time. In the meantime, fans have a lot to look forward to. (Spoilers!) Before the end of the third season on March 25th, a regular crewmember will be exposed as a Cylon and there will be a major death. A Battlestar TV movie will reportedly be produced and air sometime between the third and fourth seasons (the fourth season is likely to begin in January 2008). There have also been discussions of a prequel series. If picked up, Caprica would take place over 50 years prior to the current Battlestar episodes and would follow the Graystone and Adama families. In a society not unlike our own, a breakthrough in robotics could potentially change everything — the marriage of artificial intelligence and a mechanical body, brought together to create the first living robot, a Cylon. Sci Fi announced the development of the series back in April 2006 but little has been heard of it since. Battlestar Executive Producer David Eick recently said the series’ prospects look good and that the decision to move forward would likely be made this month. Stay tuned! Caprica: Unimpressive Debut Ratings; Cancel or Keep It? Battlestar Galactica: New Movie in the Works — Is It What Fans Want? 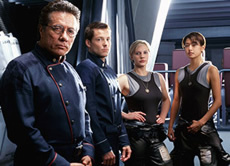 Battlestar Galactica: Prequel Still Possible, No Movie Planned – Yet! Battlestar Galactica: Olmos Correct! Season Four Is the Last! Battlestar Galactica: Will Season Four Be the Last?